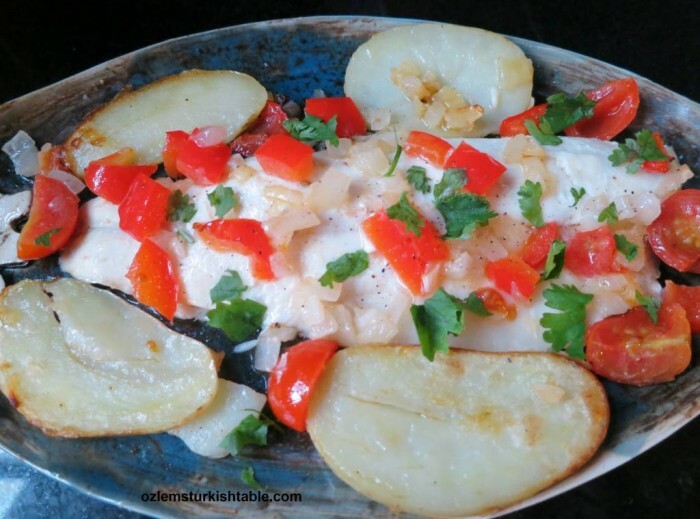 I love poaching fish with layers of vegetables in a little water and olive oil; this method of cooking is called “bugulama” (steamed) in Turkish cuisine. This way of cooking is not only healthy but also very delicious and easy to make. This recipe is also gluten-free. I used sea bass fillets in my recipe but any fillets of white fish, as well as sardines and anchovies would work here (if you like anchovies, you may also enjoy my Poached anchovies or anchovy stew with vegetables; Hamsi Bugulama recipe at this link). Tomatoes, onions and green bell or pointy peppers add a lovely, clean flavor in their own juice. Slices of lemon and parsley also add a delicious, refreshing taste to this all in one pot, healthy dish, packed with flavor. 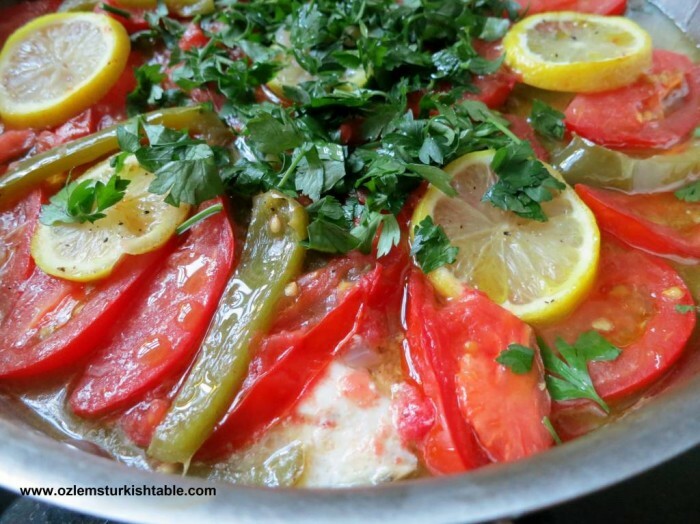 I hope you enjoy this delicious and easy Seabass Stew, Balik Bugulama. You can serve steamed potatoes or this delicious baked potatoes, peppers, red onion and olives with cumin and red pepper flakes by the side. This delicious steamed sea bass stew with vegetables, Levrek Bugulama, is healthy, easy and makes a complete meal with all the fresh vegetables in it. Tomatoes, onions and green bell or pointy peppers add a lovely, clean flavor in their own juice. Slices of lemon and parsley also add a delicious, refreshing taste to this all in one pot, healthy dish, packed with flavor. You can use any other white fish fillet of your choice. Heat olive oil in a large, heavy pan. Stir in the chopped onions and peppers. Sauté until soft, for 3-4 minutes. Add the chopped garlic, lemon juice and water. Cover and cook over medium to low heat another 5 minutes. Turn the heat off. Place the fish fillets over the cooked vegetables. Spread the sliced tomatoes and lemon over the fish. Season with salt and freshly ground black pepper. Once cooked, sprinkle the chopped parsley over and serve hot. You can serve steamed potatoes or this delicious baked potatoes, peppers, red onion and olives with cumin and red pepper flakes at my blog, by the side. I hope you all had a wonderful summer; for us, it really was so good to be back home, Turkey. I was in Istanbul, the city that makes my heart beats fast. Seeing my favorite sights like the Hagia Sophia and catching up with family and friends were the highlights, precious times. And not to forget the glorious Turkish food! 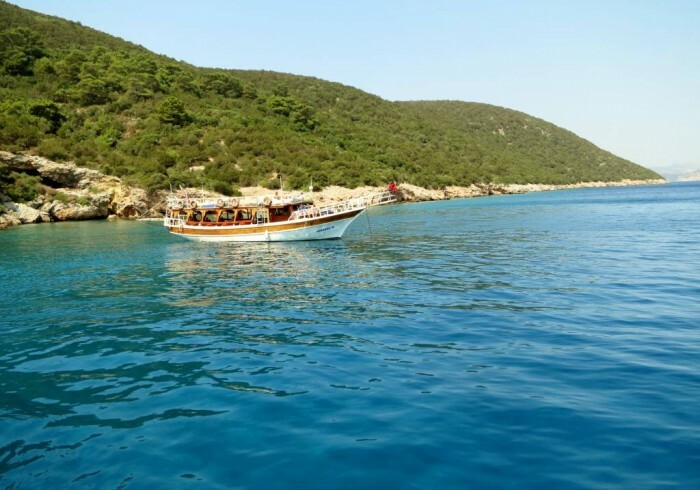 We also spent time in Bodrum, at the southern coast; magical bays, gorgeous turquoise sea, warm, friendly folks; it was a very memorable, special holiday. 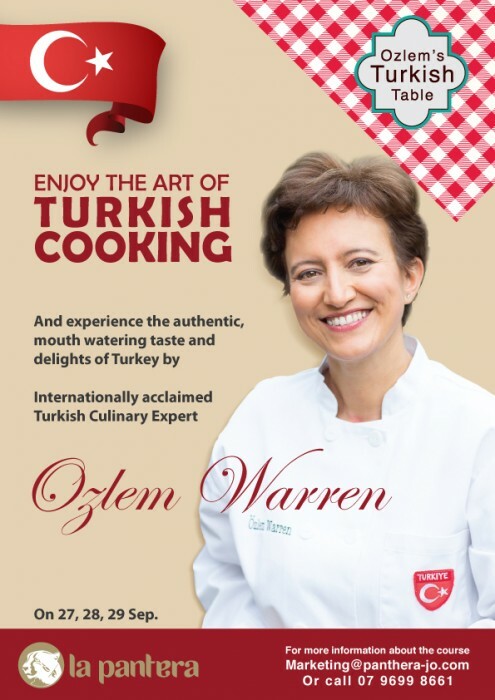 I am delighted to be returning to Amman, Jordan to teach a 3 day Turkish Cookery Course from September 27th through 29th, 2016. 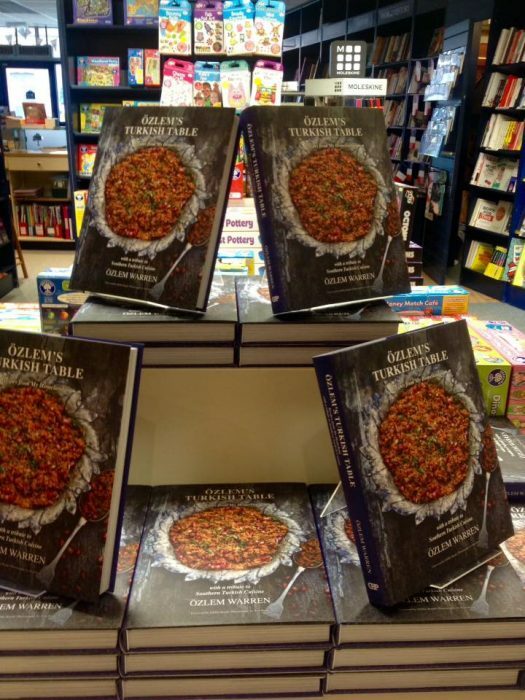 We will be covering a feast of 14 classic Turkish recipes during our course. I greatly look forward to sharing delicious Turkish cuisine with food lovers again in Amman. Here’s the course details if you can join us. Heat 2 tbsp. olive oil in a large, heavy pan. Stir in the chopped onions and cook until soft, for 3 -4 minutes. Add the chopped garlic and tomatoes and cook over medium to low heat for 3 minutes. Pour in the water or fish stock, lemon juice and season with salt and freshly ground black pepper. Cook gently for another 2 minutes on low heat and leave to cool. Par boil the potatoes in boiling water for 10 minutes, then drain the water and leave to cool. Once it is cool enough to handle, cut in half and slice thinly. Grease a baking dish with the remaining 2 tbsp. olive oil and place the fish fillets and potato slices in the dish, coat them with the olive oil. Season with salt and freshly ground black pepper. 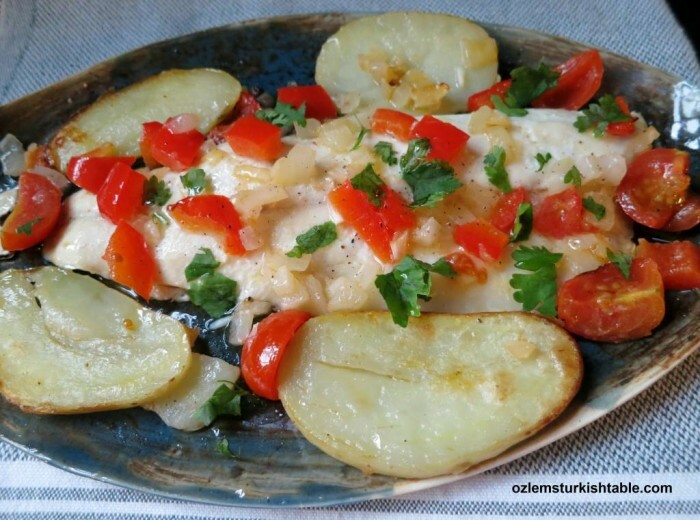 Spread the tomato and onion mixture over the fish fillets and place the potato slices alongside the fish. Cover the baking dish with aluminum foil and bake in the oven for about 20 - 25 minutes (Please check the recommended cooking time for the fish of your choice on the packaging). Once cooked, take the foil out and sprinkle chopped parsley and red pepper flakes over the fish. Serve immediately with wedges of lemon by the side. Please check the recommended cooking time for the fish of your choice on the packaging. Midye Dolma, stuffed mussels with aromatic rice, herbs and spices, is a delicious treat we love as a nation. 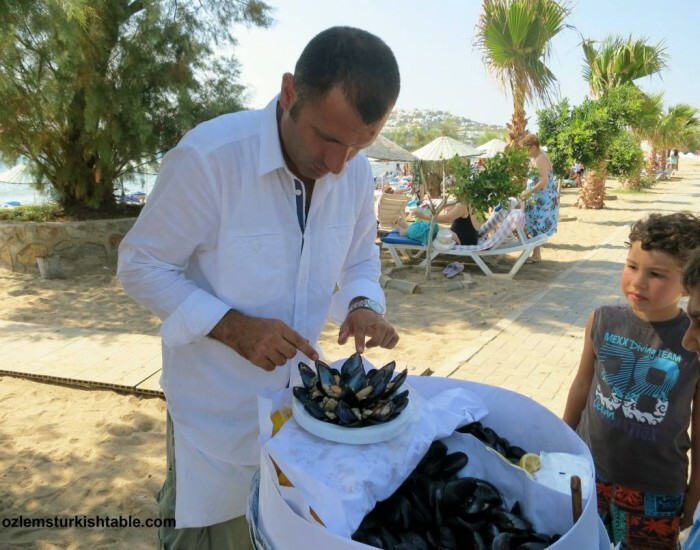 A favorite street and beach side food in Turkey, we would get a plateful of stuffed mussels from the local vendor at the beach in Turgut Reis, Bodrum. My son would tuck them in straight and they disappear far too quickly. You would also be welcomed by the street stalls, selling stuffed muscles in Istanbul, especially at Beyoglu district. You gently break off the top shell, give a good squeeze of lemon juice over the mussel with aromatic rice then scoop this delicious mixture with using the loose shell as a spoon, just heavenly. 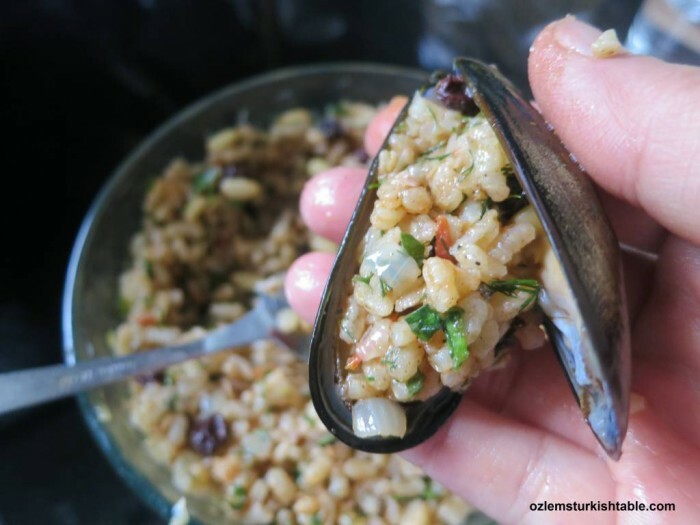 I was greatly inspired by Somer Sivrioglu’s amazing Turkish cookery book, Anatolia; Adventures in Turkish Cooking and encouraged to have a go at making stuffed mussels, midye dolma at home. My recipe here is slightly adapted from Somer’s recipe in Anatolia cookery book. 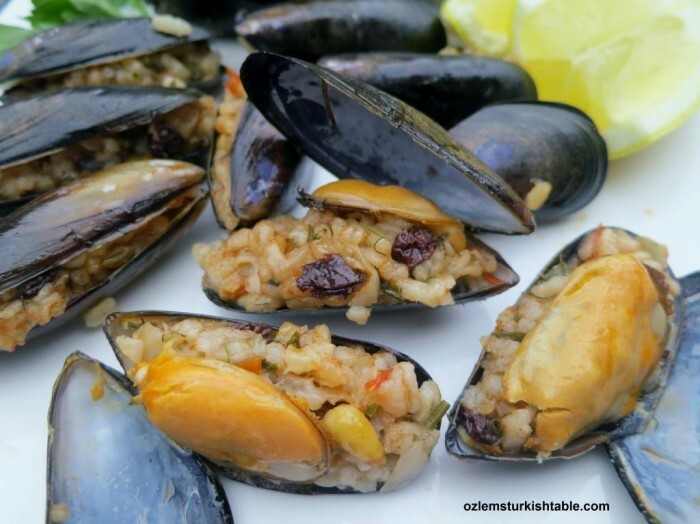 This stuffed mussels recipe along with other authentic 90 recipes are included in my cookery book, Ozlem’s Turkish Table, Recipes from My Homeland. If you’d like to get a signed copy, you can order at this link, for a limited period. Put about 2 tsp. of stuffing into the middle of each mussel (try not to overfill) and push the half shells together again. 1.Opening the shell of the live mussels may seem a little challenging at first; soaking them in warm water helps to open the shell, as it relaxes the mussels. Make sure to discard any broken or open shells. Tap any half open shells; do not use any that do not close immediately. 2. The herby, aromatic rice itself is really delicious and you can make it ahead of time. I made mine a day ahead of time and kept in the fridge, covered; it really helped for the flavors to settle. 3. Plenty of onions in the aromatic rice really go well; they pack a lot of flavor combined with currants, pine nuts, herbs and spices. I like to add a little red pepper flakes to bring a delicious but not over powering heat to the mussels. 4. 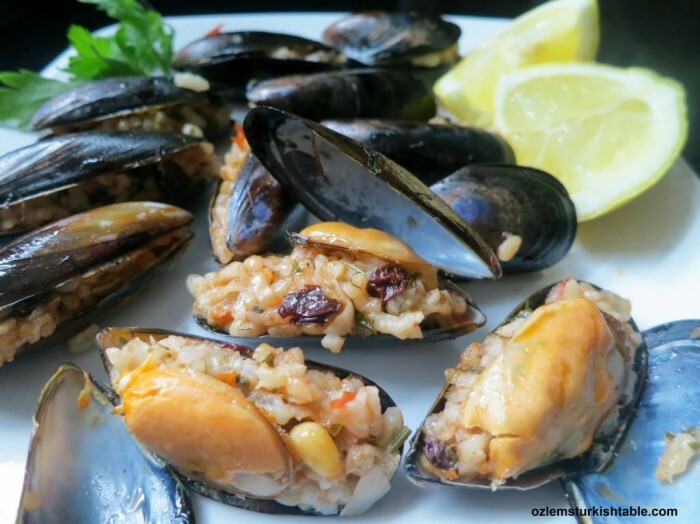 Try not to over stuff the mussels with the aromatic rice, as the rice will need a little space to cook further. I was very glad to have a go at this delicious delicacy, midye dolma. It was well worth the effort and we as a family greatly enjoyed these stuffed mussels. The juicy currants and crunchy pine nuts go so well in the aromatic rice with herbs- they are a marriage made in heaven with mussels. Midye dolma would make an impressive, delicious starter or if you really like them like my 11 year old son, it may be your main course! 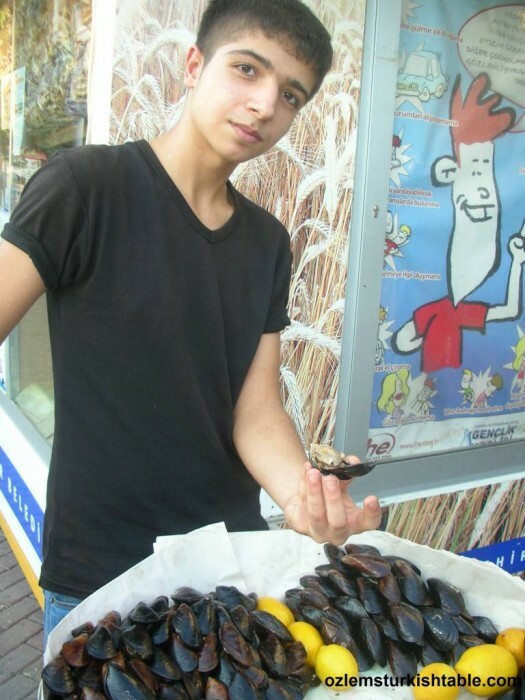 Midye Dolma, stuffed mussels with aromatic rice, herbs and spices, is a delicious street food we love as a nation in Turkey. They are well worth the effort to make at home; these scrumptious stuffed mussels, midye dolma would make an impressive starter or if you really like them like my 11 year old son, it may be your main course! Place the currants in a bowl, cover with warm water and soak for 15 minutes. Then drain and set aside. Place the rice into a sieve and rinse well under cold running water. Drain the rice and set aside. Make the stuffing first (you can also make the stuffing a day ahead of time). Heat the oil in a medium sized pan and stir in the onions. Sauté over medium to high heat for 5 minutes. Stir in the pine nuts to the onions, sauté over medium heat for 3 minutes, stirring often. Add the rice, currants, chopped tomato, tomato paste, spices and season with salt to your taste. Pour in the hot water (about 240 ml/ 8 fl oz. / 1 cup) and combine all well. Bring to the boil then cover to simmer over low heat for 15 minutes, until all the liquid has been absorbed. Rice will be “al dente” and still have a bite to it. Remove from the heat and leave to cool. Once cool, stir in the chopped dill and parsley to the aromatic rice and combine well. Check the seasoning and add more salt or ground black pepper if you’d like. Set aside to cool. You can cook this delicious aromatic rice a day ahead of time and keep in the fridge, covered. This really helps the flavors to blend in and phase your cooking time wise. Now, open the mussels. If you’ve bought the mussels in a vacuum bag, open the bag over a bowl to catch any liquid inside. Place the mussels in a large bowl and rinse under cold water. Scrub the shells clean and scrape off any dirt. Using a blunt knife, carefully force the point of the knife into the gap at the pointy end of each mussel (if opening the shells become challenging, soaking them in warm water helps to open the shell, as it relaxes the mussels). Slice through the meat so the shell opens with half the meat attached to each half shell – once you cut through the thick, round connecting muscle at the bottom of the mussel, it will be easy to open. Pour the juice from the mussel to a bowl. Snip off the beards and using your finger, remove any grit at the base. Spread the half shells to tear the muscle of the mussel, but leave the two halves connected. Put about 2 tsp. of stuffing into the middle of each mussel (try not to overfill) and push the half shells together again. Place the mussels on a wide heavy pan, with the tips pointing outwards towards the edge of the pan, with the shells slightly overlapping (to prevent them opening). Build a tight spiral of shells in the center of the pan. There should be one layer of mussels, so if you have mussels left over, use another pan to keep on the layering. Place a wide plate over the mussels to prevent them from opening too wide while they cook. Strain the mussel juice through a sieve lined with a double layer of muslin (cheese cloth) three times to remove any grit. Mix the mussel juice with water, make it up about 250 ml/ 9 oz. / generous 1 cup water (have another 1 cup of water ready if you are using two pans). Pour this mixture to the pan; the water level should only reach to the half of the shell. Cover the pan and bring to the boil, then reduce the heat and simmer for 15 minutes. Remove the mussels from the heat and leave to cool at room temperature. Then cover and keep them in the fridge for 30 minutes – 1 hour to cool further and for the flavors to settle. Serve stuffed mussels with aromatic rice, midye dolma on a big platter with lemon wedges by the side. They are best enjoyed eating with your hands, using the top shell to scoop the mixture out of the bottom shell, with a generous squeeze of lemon over the mussel with aromatic rice.